In the center of Brooklyn, New York, is the Bedford-Stuyvesant neighborhood. It’s a historic area lined with brick brownstones, but nearly 40 years ago, it was a tough one, full of drugs and violence. To Cyndia Morales Muñiz ’13EdD, assistant director for multicultural academic and support services, it was home, a place to share in the rich culture of her community. Muñiz’s parents immigrated to New York in the 1950s from Puerto Rico, looking for a better life. They spoke little English and lived in a low-income area, often using public assistance to make ends meet. All of her peers in the neighborhood public school qualified for free lunch. She grew up just a few blocks away from Graham Avenue, a street that locals dubbed the “Avenue of Puerto Rico.” Her community was a mixture of African Americans and Puerto Ricans, an environment that grounded her with a strong sense of identity. The odds, she herself admits, were stacked against her. And yet, she became the first in her family to earn a college degree. She received a master’s degree in sociology from St. John University and a doctorate of education from UCF. 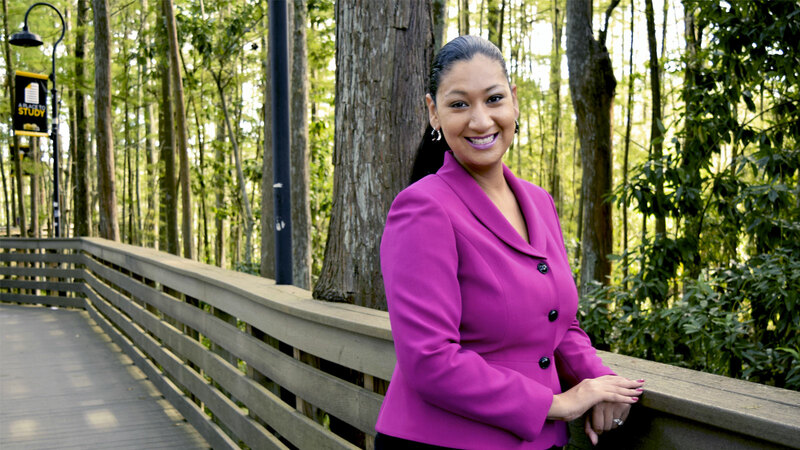 Since graduating, she has been honored with the Orlando Business Journal’s “Women Who Means Business” award and was included in the publication’s “40 Under 40 Award.” She’s won a Women’s Achievement Award in Diversity in 2015 from the Women’s Executive Council of Orlando, an El Josco Award from the Puerto Rican Chamber of Commerce of Central Florida for her contributions to education, and was named one of the Top Latino Leaders in the U.S. by the Council for Latino Workplace Equity. On Monday, October 17, Muñiz received the Diversity and Inclusion Impact Award during UCF’s 17th Annual Diversity Breakfast for her work with multiple organizations, including the Hispanic Chamber of Commerce of Metro Orlando’s Young Professionals Council and the Hispanic Heritage Scholarship Fund of Metro Orlando, and for founding the UCF Latino Faculty & Staff Association last year to advocate for the needs of the Latino faculty at the university. From humble beginnings, Muñiz has cemented herself as not only one of the most accomplished leaders at UCF, but also in the entire state as well. The question many ask, she says, is how she made such a climb, which for many seems insurmountable. She recalls that in kindergarten she always earned “Student of the Month” and attendance awards. She had a drive to succeed and she carried that with her throughout her school years and into her professional career. It was more than a desire for Muñiz: It was a responsibility. She says that she was her toughest critic, motivated by a duty to repay not only her family, but other members of the Latino community that came before her. Her role models throughout her journey were her parents. She pushed herself so their sacrifices, the discrimination they faced because of what they looked like and how they spoke, would mean something. Now as a professional in higher education, Muñiz uses her position to support multicultural and first-generation students who are walking paths similar to her own. It is her job to make sure these students will be career-ready upon graduation. Helping this particular group of young adults is the reason why she took the position at UCF in the first place. Helping these students find the resources they need to achieve their goals in life is what Muñiz says fills her heart with the greatest joy and purpose. It’s a passion that extends to helping the entire Latino community. As someone extremely proud of her Puerto Rican heritage, Muñiz credits her greatest accomplishment to representing all of the positive influences the Latino community has to offer. Members of the Latino community who have managed to make it, Muñiz says, now need to look back and help the next generation forge their own paths.